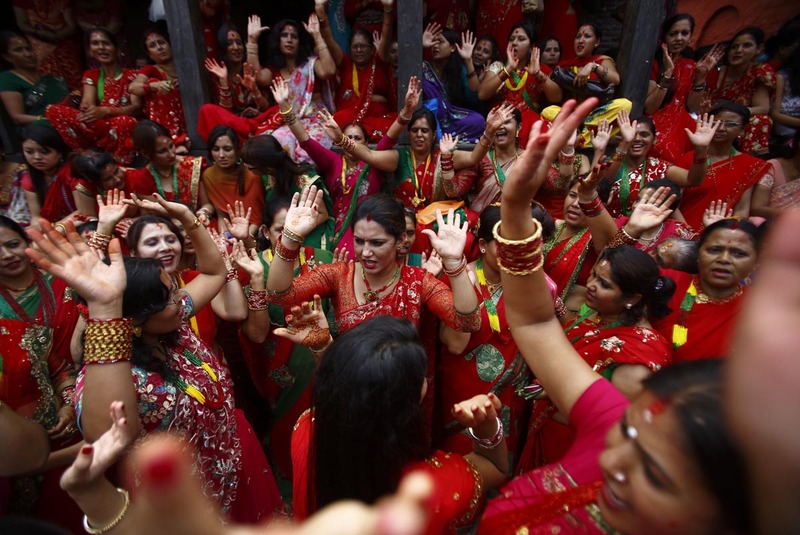 Every year as the festival of Teej — arguably the most important festival for Hindu women — approaches, women and girls get pumped up and gather to celebrate. Dancing to the aforementioned tune was a group of women, clad in red and green saris and kurtas, on Monday at the ‘Dar Eating Program’ at Amrapali Banquet, Naxal. 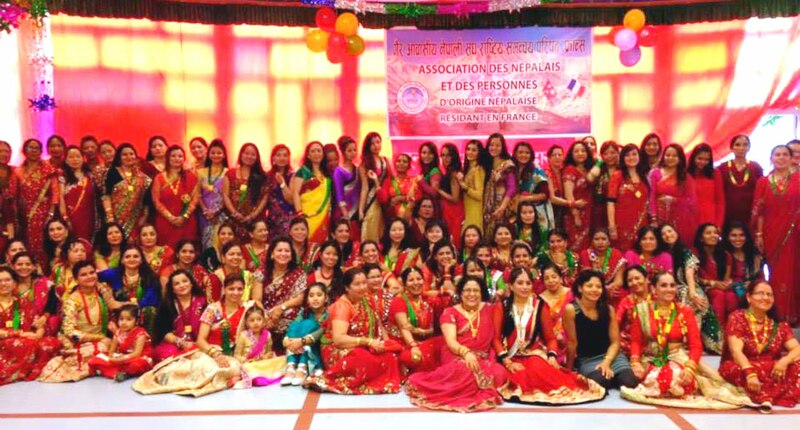 These women were friends, colleagues and acquaintances, who had taken their time off to come out and celebrate the spirit of Teej. 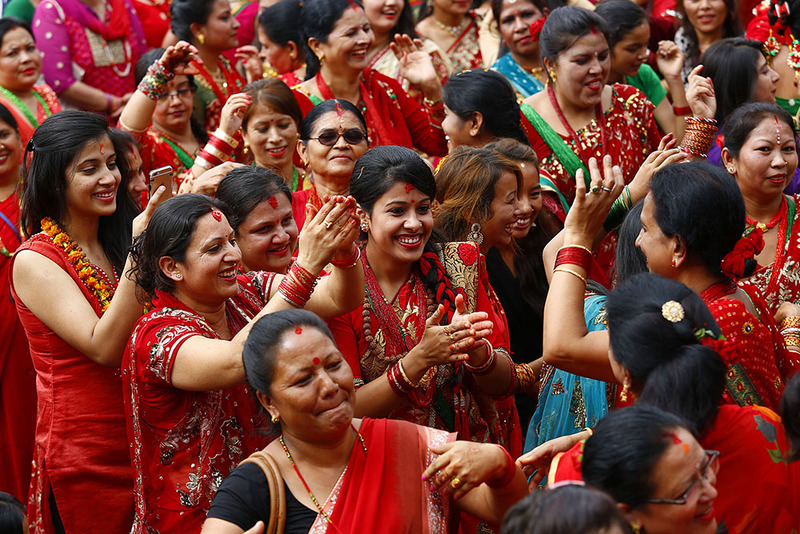 As Teej neared, to be celebrated nation-wide on August 24 this year, streets of Kathmandu were crowded by women and girls wearing red saris and attractive jewelries. Previously considered a one-day affair, women of various age-groups these days gather in banquets to eat Dar weeks before the day of Teej. 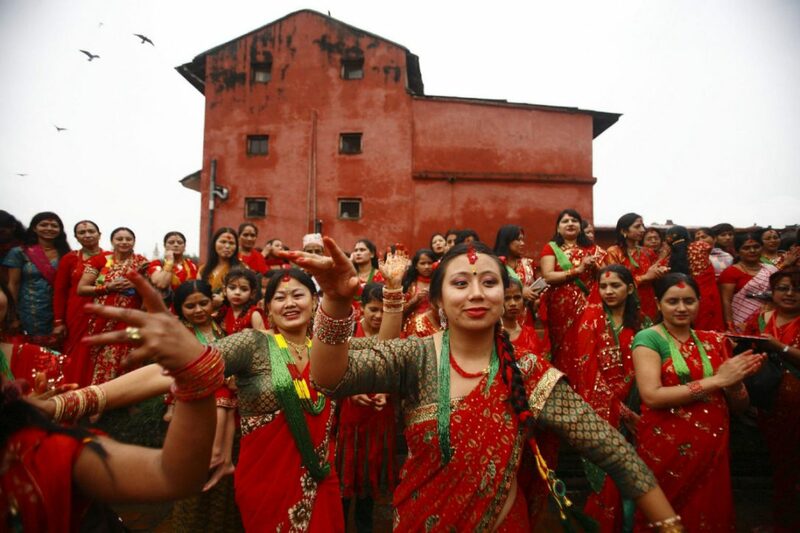 Women sing and dance at Pashupatinath Temple during the Teej festival in Kathmandu The three-day festival, commemorating the union of Goddess Parvati and Lord Shiva, involves sumptuous feasts and rigid fasting. Hindu women pray for marital bliss, the well-being of their spouses and children, and the purification of their own bodies and souls during this period of religious fasting. Dar is a name given to the meal consumed by women a day before the day of Teej, particularly because they are to observe fast, without even drinking a single drop of water, the following day. Dar comprises of protein and carbohydrate-rich food, which when consumed in ample amount would fill for the hungry stomachs the following day as women observe fast until sundown. Hindu married women believe that fasting on the day of Teej will provide longevity to their husbands. In case of unmarried women, the fast is believed to earn them a suitable match. Singing and dancing at pashupatinath temple. The tradition of Teej and Dar, however, has adapted a few changes over the years. Dar eating programs are organized in banquets and halls, outside the borders of family home and relationships. 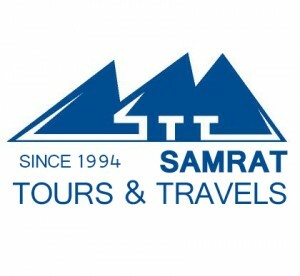 Banquets and event halls, undeniably, have benefitted hugely from this trend. Apart from the wedding season, these kinds of events earn them ample revenue. Ishara Koirala, a master’s student at Ratna Rajya Laxmi Campus, said such programs were good excuses for women to take some time off and socialize. Perhaps the tradition has after all not changed much as compared to old times when women used to gather around Pati and Pauwa and sing both happy and sad verses in relations to their lives. “These events are not much different from what used to be, since women get to catch up with their counterparts, relax and socialize,” remarked Koirala. Forty-year-old Bishnu Lama, who owns a canteen in Sundhara, recalled a recent invite to Yak Party Palace, Pulchowk for Dar and shared that it was fun as well as relaxing to be at a place away from daily-life nuances. Changes are evident not only when it comes to how and where these Dar programs are being organized, but also how the fasting culture is observed. “Fasting culture, over the years, has changed,” remarked 86-year-old Aruna Pokharel. She lives in Baneshwor and was visiting Mahadevsthan Temple of Koteshwor on Monday. She is a regular visitor to the temple. “When I was young and able, I would fast every Monday during the month of Shrawan and in Teej. I would start my Teej fast with a small puja, eat nothing, not even a single drop of water, and break my fast only after sundown,” said Aruna. Undeniably, the norms behind fasting have changed. Growing up, one can find varied narratives being provided to girls and women regarding the fasting tradition. While a working sister-in-law may eat a few fruits during the fast, stay-at-home moms preach stronger guidelines on how to be religious and thorough about it. Some say avoiding salt and vegetables work as a fine substitute, while others insist complete abstinence from eating and drinking. 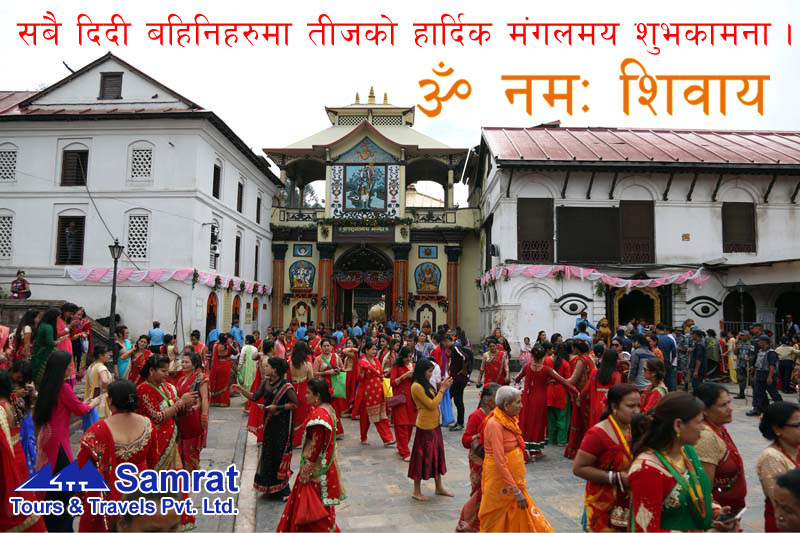 Tagged Festival of Nepal, pashupatinath darshan, teej celebrate, teej festival, Woman Festival. Bookmark the permalink.